John Singer Sargent (January 12, 1856 – April 14, 1925) was an American artist, considered the "leading portrait painter of his generation" for his evocations of Edwardian era luxury. During his career, he created roughly 900 oil paintings and more than 2,000 watercolors, as well as countless sketches and charcoal drawings. His works documents worldwide travel, from Venice to the Tyrol, Corfu, the Middle East, Montana, Maine, and Florida. His parents were American, but he was trained in Paris prior to moving to London. Sargent enjoyed international acclaim as a portrait painter. From the beginning his work was characterized by remarkable technical facility, particularly in his ability to draw with a brush, which in later years inspired admiration as well as criticism for a supposed superficiality. His commissioned works were consistent with the grand manner of portraiture, while his informal studies and landscape paintings displayed a familiarity with Impressionism. 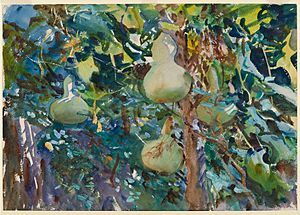 In later life Sargent expressed ambivalence about the restrictions of formal portrait work, and devoted much of his energy to mural painting and working en plein air. He lived most of his life in Europe. Art historians generally ignored the society artists such as Sargent until the late 20th century. In 1922 Sargent co-founded New York City's Grand Central Art Galleries together with Edmund Greacen, Walter Leighton Clark, and others. Sargent actively participated in the Grand Central Art Galleries and their academy, the Grand Central School of Art, until his death in 1925. The Galleries held a major retrospective exhibit of Sargent's work in 1924. He then returned to England, where he died on April 14, 1925 of heart disease. Sargent is interred in Brookwood Cemetery near Woking, Surrey. Memorial exhibitions of Sargent's work were held in Boston in 1925, and at the Metropolitan Museum of Art in New York, and the Royal Academy and Tate Gallery in London in 1926. The Grand Central Art Galleries also organized a posthumous exhibition in 1928 of previously unseen sketches and drawings from throughout his career. The Portrait of Robert Louis Stevenson and his Wife was sold in 2004 for US$8.8 million and is located at Crystal Bridges Museum of American Art at Bentonville, Arkansas. In December 2004, Group with Parasols (A Siesta) (1905) sold for US$23.5 million, nearly double the Sotheby's estimate of $12 million. The previous highest price for a Sargent painting was US $11 million. John Singer Sargent Facts for Kids. Kiddle Encyclopedia.